and helps clear obstacles out of the way. Be sure to sign up for my newsletter to get the latest news and event dates. Heal from the now. Reconnect with your HEALING SELF in this powerful retreat. It is possible for you and each person to navigate the HEAL PART OF YOUR SELF through an awareness training into the foreground of being. Due to many requests, in addition to the 3 h workshop, there is this 5 day Intensive on Gozo. Heart teacher & mystic Thomas Young will initiate and accompany this navigation with a variety of exercises and meditations. Access to new and especially healing forms of presence are practiced. At the same time, old belief patterns are released in a powerful field experience and the participants are prepared to let the HEALING SELF flow into their everyday lives. This retreat is also very suitable for healers, therapists, teachers and mentors, who will have the opportunity to test self-healing powers and later integrate them into their professional lives. 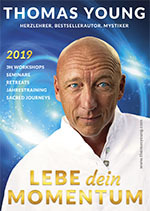 Right after our HEALING FLOW GOZO retreat is the start of the 1. module of the YEAR LONG MOMENTUM MASTERY 2019 – from We 22.05., 8 pm to Su 26.05.2019, 2 pm. More details under YEAR LONG TRAINING. If you should participate in both retreats HEALING FLOW GOZO will be discounted from Eur 595,- to Eur 400,-. Mastering the momentum is considered the High Art of the heart teachings and of life in itself. The moment where everything falls into time and place and we experience a state of flow. We act completely at ease from the very core of our being. The universe all of a sudden supports our movements. We are extremely charged with energy. Everything functions and works out by itself, or better by the Self. This mastery is a process which every one can learn. The MOMENTUM MASTERY Year Long Program 2018 will clarify who you really are: Your visions, the depth of your soul, your highest calling, your special gifts, your life’s dream. In 4 modules we will devote ourselves of the principles of manifestation and the creation of unlimited possibilities. The Group Training aims at leading every participant into their highest momentum, be it in their profession, thier relations, their health or as a spiritual being. The energetics and increased forces of the MOMENTUM MASTERY lead to transformation in all areas of life. Principles of successful manifestation. Thoughts and seeds of grain. Emotions as fuel. Living in alignment with soul. Turn to the Inner. Powerful imagination. Soulful dreams. The Highest Calling. Choosing your destiny. The law of attraction. Magnetizing kindred spirits into your life. Connecting through your heart. Find helpers and allies in visible and invisible dimensions. Cultivating Higher Trust. Developing heart intelligence and soul force. Creating from eternity. Gather your medicine. Turn around the axis of time. Begin through the end. Wondrous ways of the mystics. Becoming time. Activating resources from other life times. The wonder of becoming. Intention and action. Multidimensional perception. The Power of Wow. The Art of Awe and Wonder. Learning to love change. Mastery as the conscious creation of reality. The realization of your heart. Complete success consciousness. Being your very, very best. Seminar fee for the whole time: Eur 2250,- plus room/board. On the small Maltese Island of Gozo in the Mediterrean Sea you will find the oldest temples and artefacts of mankind – more ancient even than the pyramids. There are sources who speculate that Mary Magdalene and Jesus probably have initiated each other in one of the ceremonial sites.The limestone of this island stores the energy of many millenia as well as of Atlantis. There are power spots on Gozo which connect so immediately withlife force as in no other place on earth. During our retreat we want to explore openheartedly all the different sites and connect joyously with their energies – one of them being the Temple of the Mother Goddess. At the same time we will bring our love to these places so that a new space can be created to directly experience the mystical depth of one’s own soul. Meditation and ceremony are way more powerful if practised on these sacred places in nature. In this Conference the participants will experience a ceremonial initiation into the Heart Center and its wondrous resources. This life-renovating experience includes the exploration of energy fields, dream work, meditation, Yoga, Silence and Fasting, oracular work, individual as well as collective rituals.Sacred Heart is a deeply transformative experience for its participants. The conference is considered a milestone in many spiritual biographies. Students experience a direct soul contact. The retreat takes place in the Centro d’Ompio at Lago di Orta, North Italy. The mediterranean foliage of the centro and his solitary position high over the lake touches the heart in and of itself. The Centro is beautifully located on a sunterrace above lago Orta /North Italy. It borders large chestnut forests perfect for beautiful hikes in nature. An ideal vortex for the days of the initiation. For questions as regards room & board please ask our office. A sacred journey into the Pyrenees of South France to places where Mary Magdalen has been living. Here, in the legendary land of the Cathars we go into touch with the energies of those times. We stay at a retreat center from which we start our excursions to churches, stones, labyrinths, castle and caves. Those will lead us to Rennes-Le-Chateau, Monsegur, Mont Bugarach, the cave of Mary Magdalen, etc. It is a journey of the heart, for those souls who can sense the presence of Mary Magdalene within themselves and have a longing for an even deeper reconnection. This land is like Sedona extremely charged with higher vibrations and ancient wisdom. An openness for a deep transformation is a prerequisite for partaking in this retreat. This is not a sightseeing tour, but a spiritual journey where the inner and outer levels of reality coalesce into a synchronistic resonance. The voyage itself becomes the initiation. A wonderful opportunity to reconnect with Mary Magdalen at the places where she actually lived. Seven days that will change your life. A week of transformation setting free the higher octave of love, truth and freedom. The lief-changing experience leads to a new form of radical presence. The unique retreaet enables participants to win a new perspective of the larger story of their life’s journey and soul purpose. Individual soul force will be significantly heightened through learning and practicing the seven hearts of the mystic. A true gift for those who are working with the human spirit and know how to bring the seven hearts to life.“He who masters the seven hearts, reaches the unspeakable peacefulness of the mystic, the heartfelt presence of God in every cell, the compassionate view of the Wise Ones into the world. Due to the great resonance as regards the Seven Hearts, the unique retreat will take place one more time in 2019. Please sign up under registration with the possibility to pay directly or register via email with leaving your name, adress and phone number. You then will receive a short confirmation and may decide to pay the fee in cash directly at the venue. Experience the re-connection with your own HEALING SELF in this 3 h intensive. It is possible for you and each person to navigate the HEALING SELF through awareness & training into the foreground of being. Heart teacher & mystic Thomas Young will initiate and accompany this navigation with a wealth of exercises and meditations. Access to new and healing forms of presence will be practiced. At the same time old belief patterns are released in a powerful field experience and the participants are prepared to let the HEALING SELF flow into their everyday lives. Extraordinairy Event for the manifestation of your soul’s dream. Experience how your vision becomes reality! Heart teacher and mystic Thomas Young presents highly effective tools of consciousness to manifest the Sacred Dream of your Soul. Crack your body code! With methods to delete negative internal programs, the activation of force fields and timeless resources portals into new dimensions open up. The desired future will be anchored in the here and now and especially in the body. Your vision finds its way into the world. With intensive exercises and meditations from the MOMENTUM MASTERY Program! An extremely uplifting energy booster! In a 3 h Intensive including an indepth temple ritual Thomas Young will conduct a very profound clearing of 7 Generations of family history in order to rise the vibration of the heart center. The powerful experience enables to reclaim the individual heritage of the soul and to release aspects which no longer serve the highest enfoldment of one’s heart. Prepare yourself to be profoundly changed! Conscious merging with the core of your beingThe 3 h Intensive allows its participants a deeply blissful reconnection with their highest potential. In a guided ceremony Thomas Young will invite the original blueprint of your soul, to be downloaded into your 4 different bodies. It would be helpful to bring a blanket or yoga mat on which to lie down during the ceremony. Divine Blueprint opens up the possibility of experiencing the bliss of your soul while being in the body. Be invited to feel the life changing wonder of this blessing. Please sign up here with the possibility to pay directly or register via email with leaving your name, adress and phone number. You then will receive a short confirmation and may decide to pay the fee in cash directly at the venue. Experience the reconnection with the Divine Mother in this 3 h Intensive. With a moving temple ritual the connection to the personal mother will be healed on a depth level and the transpersonal aspect of the “Divine Mother” can suddenly be felt. The life-changing experience enables a new from of spiritual surrender and the acceptance of one’s own existence.Thomas Young developed a series of temple rituals which enable participants to heal, transform and breakthrough into the beauty of their souls while being held in the timeless energies offered through the teaching. Mother Healing touches the hearts of many with an experience of the unconditionally felt love from the feminine side of creation. Please sign up her with the possibility to pay directly or register via email with leaving your name, adress and phone number. You then will receive a short confirmation and may decide to pay the fee in cash directly at the venue.